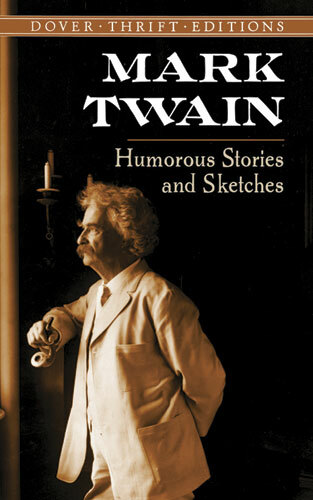 Mark Twain: Humorous Stories and Sketches by Mark Twain. Mark Twain's inimitable blend of humor, satire and masterly storytelling earned him a secure place in the front rank of American writers. This collection of eight stories and sketches, among them the celebrated classic "The Notorious Jumping Frog of Calaveras County," shows the great humorist at the top of his form. Also included here are "Journalism in Tennessee," in which a novice newspaperman is shown the "correct way" to report a news story; "About Barbers," a delightful account of every barbershop customer's worst fear; "Fenimore Cooper's Literary Offences," Twain's hilarious savaging of that author's style, and four more: "A Literary Nightmare," "The Stolen White Elephant," "The Private History of a Campaign that Failed" and "How to Tell a Story. "Delightfully entertaining, these charming pieces will find an appreciative audience among students, general readers and lovers of classic American humor. This book is required reading in Exploring America by Ray Notgrass.